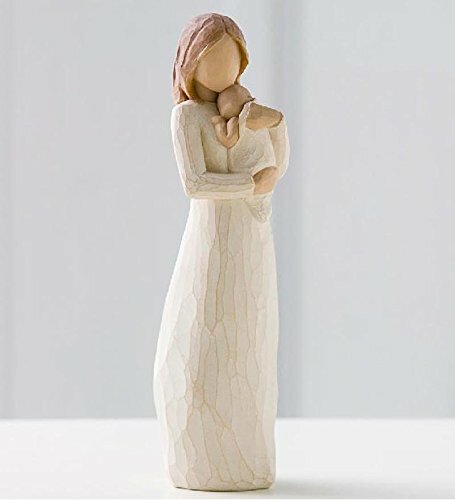 Willow Tree hand-painted sculpted figure, Angel of Mine ONLY $17.78! Score a GREAT DEAL on the Willow Tree hand-painted sculpted figure, Angel of Mine today for only $17.78 from Amazon! You will get FREE Shipping if you are a Prime member! If you are not an Amazon Prime member you can grab a FREE 30-Day Trial HERE! Get the all the Details of this deal below! TITLE: Angel of Mine SENTIMENT: So loved, so very loved GIFT-GIVING SUGGESTIONS: A gift to celebrate new beginnings, new babies, new families… and the loving relationships that develop between parent and child, grandparent and child… This piece works well with other figures to create a Family Grouping. Willow Tree is a reminder of someone we want to keep close, or a memory we want to touch. Hand-carved figures reveal their expression through body gestures only… a tilt of the head, placement of the hands, a turn of the body. Since 1999, American artist Susan Lordi has worked in partnership with DEMDACO to produce, market and distribute Willow Tree , her line of carved figurative sculpture. From her studio in Kansas City, Lordi hand carves the original of each figure. This piece is cast from Lordi’s original and painted by hand. Enclosed inside each fitted packaging box is a gift-giving card with piece title and sentiment on it. Each piece is intended to be open to interpretation from the viewer. “Willow Tree isn’t so much about the tangible piece. It represents an emotion or it marks a memory.” -Susan Lordi Ready to display on a shelf, table or mantel. To clean, dust with soft brush or cloth. Avoid water or cleaning solvents. Don’t miss this deal at Amazon Today on the Willow Tree hand-painted sculpted figure, Angel of Mine (26124) for only $17.78!